Brazil is on the board! It’s always interesting to add a new country to our geographical list of cars and Brazil is the newest addition. Puma was based in São Paolo and they got their start in 1966. Brazil was a strange case – it’s a huge country and imported cars were very expensive. Only manufacturers that built cars in Brazil really sold them there: like GM and VW. So what do you think this Puma is based on? That’s right, a Volkswagen. It’s got a rear-mounted 1.6-liter flat-four. Complete cars were available in Brazil and some were exported to the U.S. in kit form. A convertible was also offered. The Puma GT was built between 1968 and lasted up through 1995 when the company went under (the car’s popularity across the sea is one reason the company sprang back to life in 2006 in South Africa). 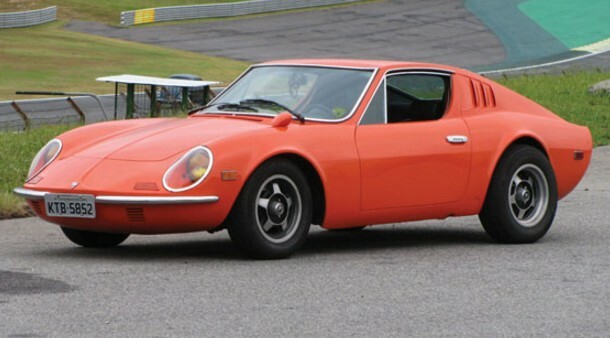 This GT is one of 330 Coupes built in 1972 (they built 484 total cars that year). Puma’s total production as a marque was over 22,000 cars. This car is fully restored and comes out of a Brazilian collection. It should bring between $10,000-$15,000. Click here for more info and here for more from this sale. This entry was posted in Uncategorized and tagged 1972, auctions, auctions america, cars, classic cars, coupe, gt, puma by classiccarweekly. Bookmark the permalink.